Monday December 20th 1897 I hurried through with the work and we had early dinner and went to town. I got the rest of the things for the christmas tree. I knit in the evening. Tuesday December 21st 1897 weather colder today. I baked bread and did other cooking. Will was late to dinner as he was helping John haul some hogs away. I knit what time I had on Mother's mittens. 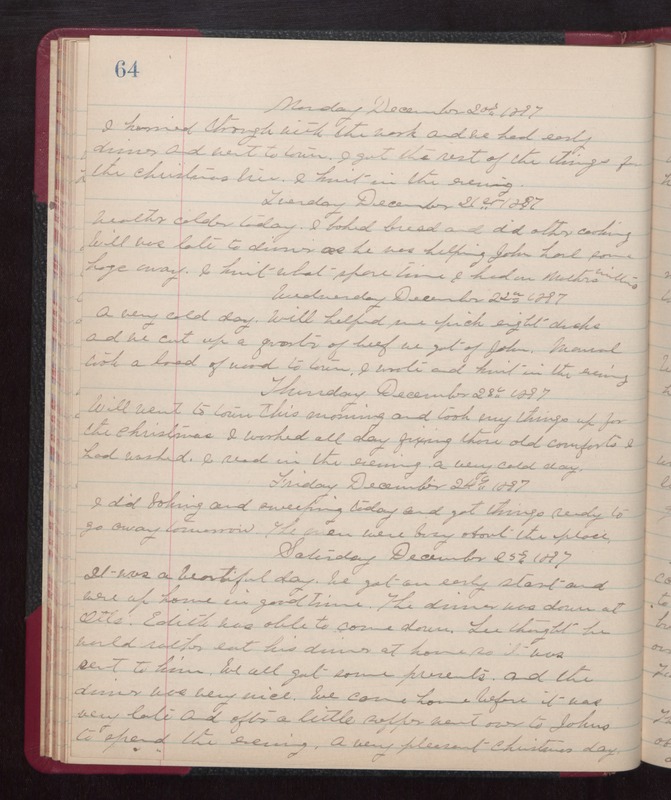 Wednesday December 22nd 1897 A very cold day. Will helped me pick eight ducks and we cut up a quarter of beef we got of John. Manuel took a load of wood to town. I wrote and knit in the evening. Thursday December 23rd 1897 Will went to town this morning and took my things up for the christmas. I worked all day fixing those old comforts I had washed. I read in the evening. a very cold day. Friday December 24th 1897 I did baking and sweeping today and got things ready to go away tomorrow. The men were busy about the place. Saturday December 25th 1897 It was a beautiful day. We got an early start and were up home in good time. The dinner was down at Otts. Edith was able to come down. Lee thought he would rather eat his dinner at home so it was sent to him. We all got some presents and the dinner was very nice. We come home before it was very late and after a little supper went over to Johns to spend the evening. A very pleasant christmas day.